Human Target: "The Trouble With Harry"
Tony Hale never appeared in the first season of Human Target. I want to stress this: Tony Hale was never on the show before the second season. He never tangled with original gang, he never got an episode that introduced us to his wacky ways or explained just why in the hell a broad, mildly amusing comic character belongs on a show about tough men firing guns at each other. And despite his protestations in "The Trouble With Harry," we've never seen him begging the team to go along on their missions or been given any reason to understand the wide variety of character traits that are ascribed to him here. I feel it's necessary to point this out, because through much of "Harry," I was experiencing a weird kind of cognitive dissonance, like someone had just reset the parameters of the Matrix, only nobody bothered to change my memory. Chance and Winston treat Harry like he's been on hand for dozens of crazy, slapsticky larks. It's just… he hasn't. Before tonight's episode, Hale had only appeared once before on the show. And it wasn't like he was so great in "Communication Breakdown" that he deserved to be canon. Apart from that momentary glimpse of a parallel universe, "Harry" was the usual dull stretch of road, featuring occasional fun action sequences punctuated with wincingly unfunny character beats and the culmination of a will they/won't they question that I doubt anyone still watching the show bothered to ask. The plot was laughably generic: A woman learns her fiance has some secrets. Namely, he's using his security company as a front for a secret squad of mercenaries who go around doing dirty work that, presumably, pays really well. Now that she knows this, the woman's life is in danger, and she wants Chance and the team's help in taking her fiance down, so that she won't have to spend the rest of her life watching her back. It's pretty impressive that Henry Claypool, for all his resources, doesn't notice when his wife takes a trip into the city to hire some good guys to destroy him, but I guess that's Darwin at work. There's a lot of ado about Ilsa's sudden decision to get involve with the mission because she just happens to know Henry Claypool. (It'd be nice if it turned out she was some sort of criminal mastermind, working to gain Chance's trust so she could kill him when he's at his most vulnerable). Everyone assumes her eagerness is because she's worried that Marshall, her dead husband, was cheating on her, and, well, it's both true and really, really weak. Nothing Ilsa does here seems all that different from her behavior during the rest of the season. She's always been aggressively interested in being part of what Chance does, and while this instance may be a little more hands-on than usual, the only real reason it stands out is that everyone keeps telling us it stands out. I'll grudgingly give the show some points for having Ilsa actually technically screw up the mission, but then I'll take those points away because, seriously, did they not think the plan through at all? They gave a paranoid guy a drugged bottle of wine. Of course he was going to give wine to Ilsa, and of course he was going to be suspicious when she initially refused to imbibe. What else could she have done? Oh, I'm forgetting the silly wrap-around story: Chance is sitting at a bar, Harry comes in, they act like they've known each other for years, and we find out Chance is actually a hostage, and he's sitting on a bomb. It's not a bad twist, as forced and unnatural as their banter is. But like so much else that's going on this season, it feels like a different show. Ames' inappropriately timed attempts to hook Chance up with an easy lay; Ilsa's obsession with the past of a character we actually care about less than we care about her; and of course, the Chance and Ilsa kiss that ends the episode, which is supposed to be a big deal, but isn't. 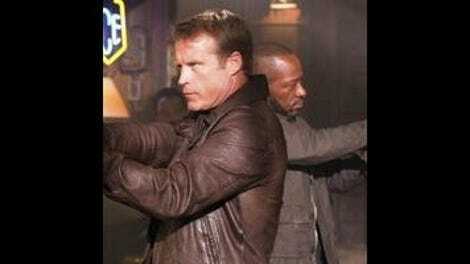 Human Target has tried to convince us of the importance of an Ilsa/Chance relationship (Chilsa? Aw, I just made myself sad) since the start of the season, not because the characters really have much in common or a particular chemistry, but because the easiest, cheapest way to give a show traction is to throw in romantic chemistry between the leads. It's worked about as well as pretending Harry is a familiar face, but it feels even worse, because we've actually been around for every painful step of this developing non-attachment. I knew it would eventually get here. I just didn't care. Is it really that easy to drug someone into giving you their password? Season finale next week! No idea if this will be back next year. Gosh, there will be so many questions left unanswered if it doesn't.